One of the main rebel leaders in the Solomon Islands, Harold Keke, has surrendered to the Australian-led force that is trying to restore peace in the archipelago. Mr Keke was taken into custody along with three other senior militants, in what was seen as a significant breakthrough for the peacekeeping force. The rebel leader surrendered near his base in the Weathercoast area of Guadalcanal island after talks with the head of the international mission, Nick Warner. Mr Keke and his supporters are blamed for a string of killings, including a government minister and a group of Anglican lay-brothers, and are alleged to be responsible for a four-year reign of terror in his remote stronghold. The four arrested men have been taken to the capital, Honiara, on board the Australian warship HMAS Manoora, Australian Foreign Minister Alexander Downer said. Mr Keke was arrested on an outstanding warrant for robbery. But there will now be a full investigation into other suspected crimes by the warlord and his followers, including murder, Mr Downer told the Australian parliament. Some 40 firearms were handed in to the intervention force by villagers in the area after Mr Keke's arrest. "This has opened the way to establishing a police post on the Weathercoast, an outcome very much sought by the people of the area," Mr Downer said. Mr Keke is suspected of murdering six men he took hostage in April, after he admitted to Mr Warner last week that they were dead. 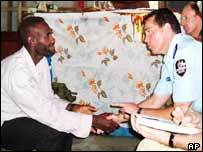 The six hostages were members of an indigenous Anglican order called the Melanesian Brotherhood. They had been held by Mr Keke for several months in his hideout in Weathercoast. At one stage they were shown on Australian television smiling and sharing a meal with the rebel leader. Mr Keke is said to have personally killed the government minister. Hundreds of people have fled their villages in Weathercoast in recent weeks to escape the rebel leader and his followers. 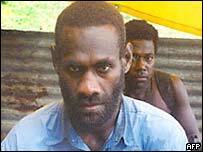 The BBC's Phil Mercer says Mr Keke began fighting for indigenous rights on Guadalcanal in the late 1990s. A brutal ethnic war with settlers from the neighbouring island of Malaita followed. The militant leader later split with his colleagues and refused to sign an Australian-brokered peace deal three years ago. "Harold Keke is now in custody on HMAS Manoora"
How the Solomon Islands spiralled out of control.